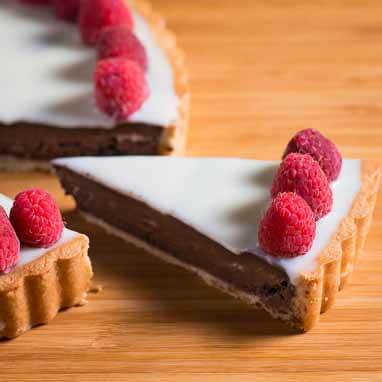 Chocolate and raspberry is a timeless flavor combination that will leave your guests' mouths watering long after enjoying your creation. In this recipe the dark chocolate is balanced by the sweet raspberry jam under (and in) the smooth, rich filling. A thin layer of silky white chocolate ganache adds a flavorful visual contrast.